Jack Brabham was a roll up your sleeves man with a love of mechanics, a head for business and a genuine interest in people, who didn’t start out wanting to be a racing driver. He wanted to be an engineer and his introduction to motor racing came quite by chance. He had a friend named Johnny Schonberg who wanted to go Speedcar racing. Jack Brabham thought that the guys who wanted to race these things were all lunatics. But he loved designing and building things with wheels so he got stuck in and built the car for Johnny Schonberg. 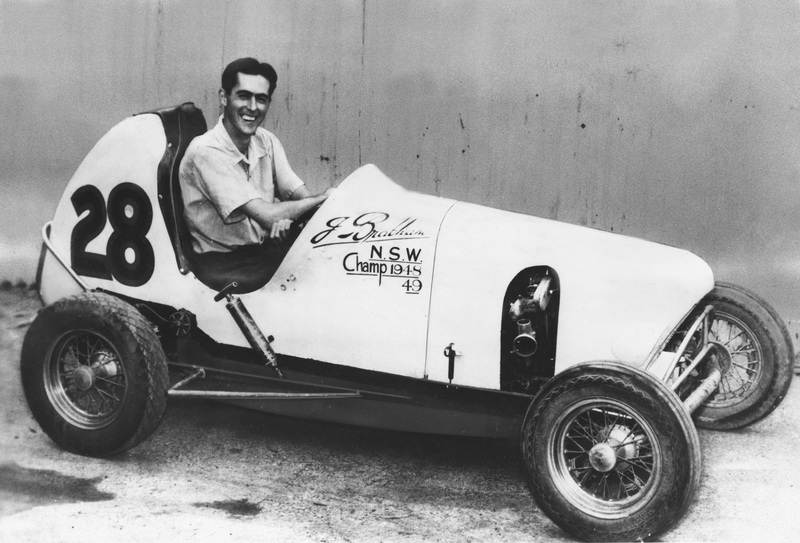 A young Jack Brabham in his Australian Speedcar having discovered that racing driving is fun. (Picture courtesy news.cision.com). The speedcar was happily driven by Johnny Schonberg until Johnny Schonberg’s wife expressed her desire that her husband desist from a sport that could easily kill him. Schonberg reluctantly agreed and then set about persuading the young Jack Brabham that he could drive the car, and thus take up a sport that could easily kill him instead. Jack discovered that Speedcar racing was rather a lot of fun, and he also discovered that he had a natural talent for it. Thus it was that he drove the car around the Australian showground dirt race tracks winning race after race until he found himself the winner of the 1948 Australian Speedcar Championships. 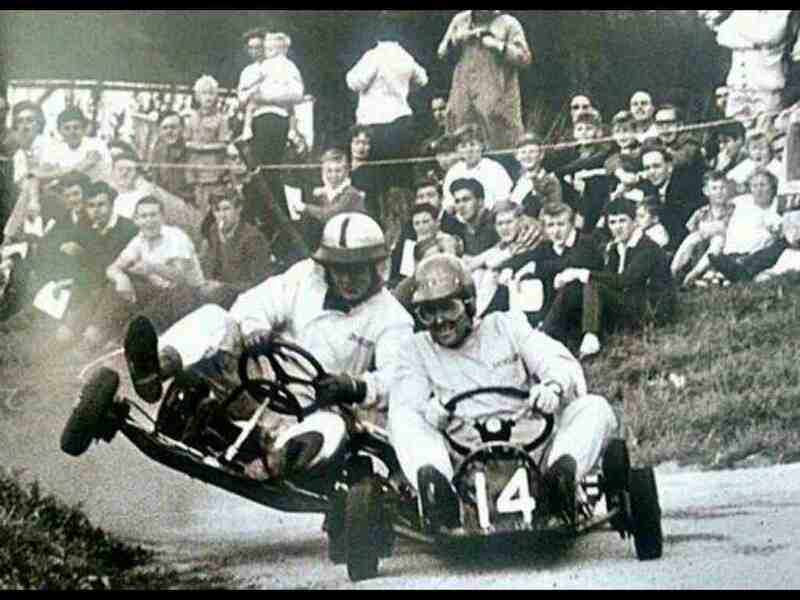 Here we see Jack Brabham demonstrating his exuberant racing methods that earned him the nickname “Black Jack” to a young Bruce McLaren. It was a short step from the dirt track Speedcar racing in front of crowds of forty thousand meat pie munching Australians to moving on to the more gentile world of tarmac racing where Jack Brabham’s highly competitive driving style earned him the nickname “Black Jack” but also earned him an invitation to go to Britain to try his hand in the top echelons of motor racing in Europe. In Britain Jack Brabham progressively gained the trust of the people at Cooper forging a friendship with John and Charlie Cooper that led to Jack progressively moving into the Cooper organization. Jack Brabham’s driving style was something of a crowd pleaser and he was able to build a mid-engined car in 1955 at Cooper. Jack Brabham at the start of the 1960 Portugese Grand Prix in a Cooper T53. (Picture courtesy Wikipedia). In 1959 and in 1960 Jack Brabham became the first Australian to win the Formula 1 World Championships driving mid-engined Cooper cars into which he had put much effort not only into driving them but in building and developing them. 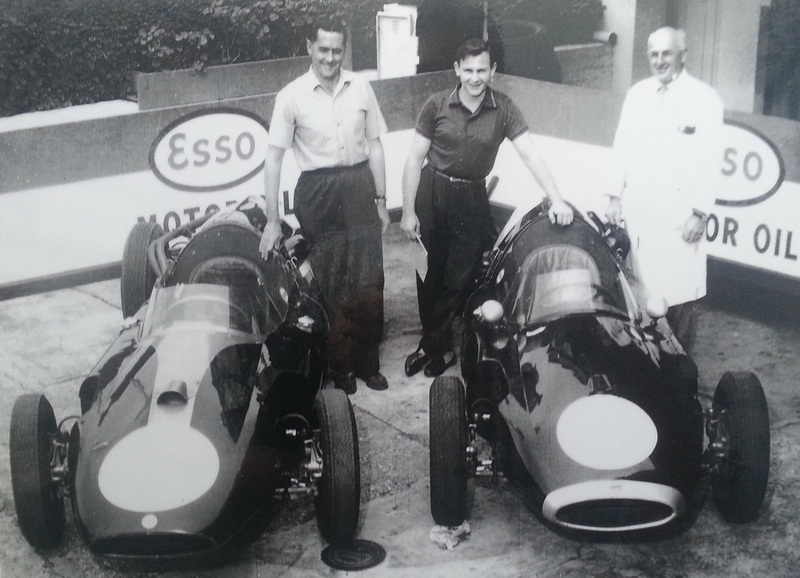 Team mates at Cooper, Jack Brabham and Bruce McLaren. (Picture courtesy jornaldeservicos.com.br). 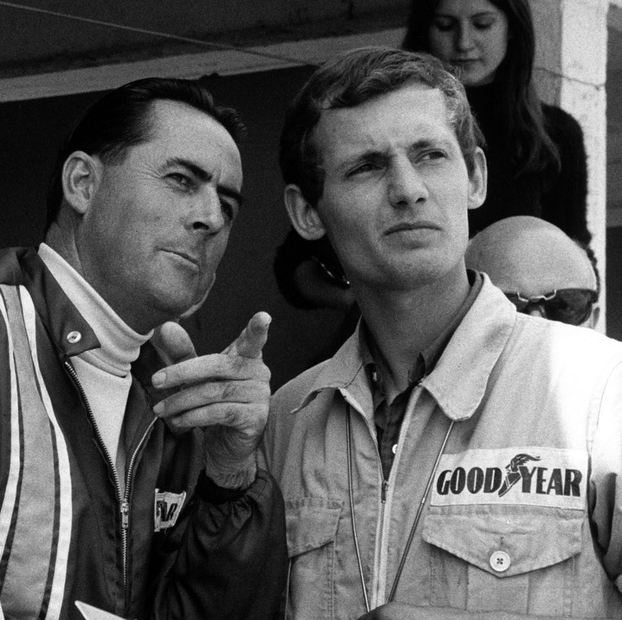 A strong friendship developed between Jack Brabham and Bruce McLaren which some have described as almost being like a father and son relationship. 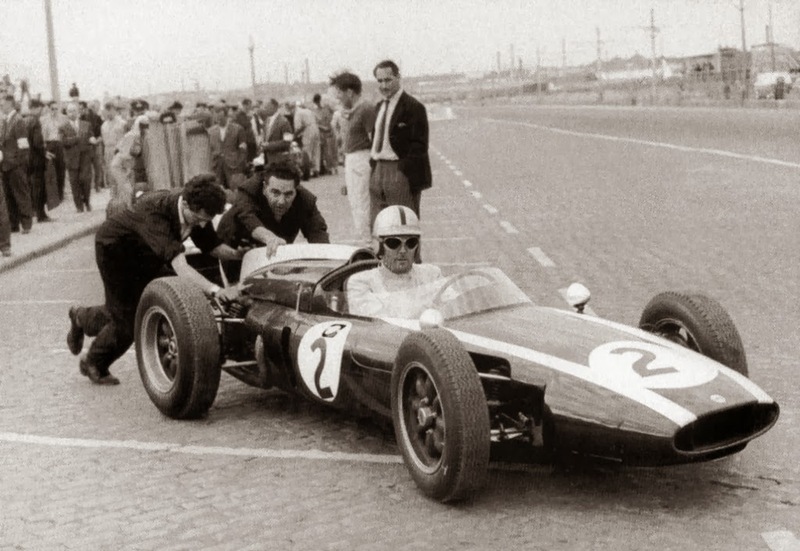 Both were driving for Cooper, Jack Brabham leaving to set up his own Brabham Racing Organization in 1962, and Bruce McLaren setting up Bruce McLaren Motor Racing Ltd. in 1963. The friendship between Jack Brabham and Bruce McLaren is one of the things looked at in the Australian ABC tribute to Jack Brabham in the fiftieth anniversary of his becoming the first Australian to win a Formula 1 World Championship. You can see the video below or on the Australia ABC website if you click here. The new Brabham Racing Organization did not have great success in the intervening years between Jack’s two Formula 1 World Championships because of rule changes which brought in small engines and Jack’s unwillingness to spend the sums of money that would have been required to become competitive. But for the 1966 year the Formula 1 rules changed to create a new 3 litre formula. Jack Brabham’s creative thinking got going and he approached Australian motor parts maker Repco to use an American Oldsmobile alloy V8 and create a Formula 1 racing engine out of it. Repco were persuaded and made the engine. Jack Brabham and his technical team created the car and he went on to become the only person to win a Formula 1 World Championship in a car of his own design and make in 1966. This story is told in “Repco-Brabham The Fantastic Year” below. Jack Brabham continued on in his love of motor sport up into the twenty first century and was driving up until old age finally caught up with him, particularly macular degeneration in his eyes. He passed away at the age of 88 on 19th May 2014 leaving behind him the legacy of a life lived with passion and determination and the people who he influenced to live life to the full. 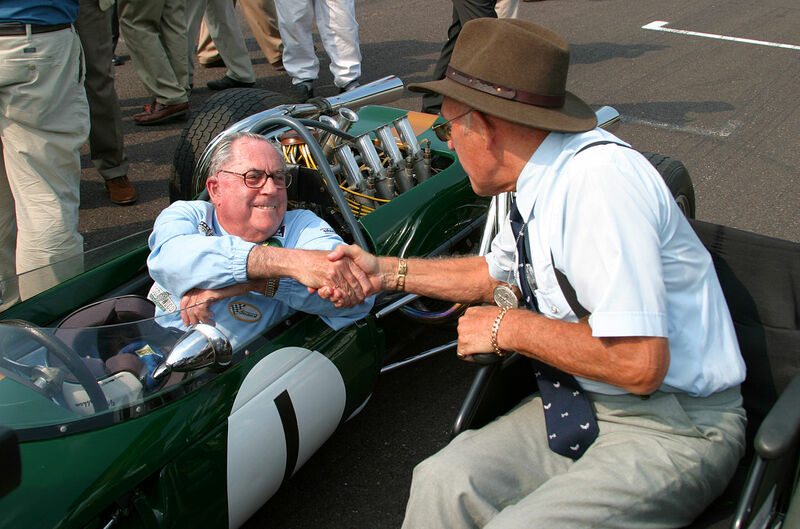 Jack Brabham and Stirling Moss at the Goodwood Revival in 2004. (Picture courtesy Wikipedia). Jack Brabham also left his autobiography as a legacy for those of us left behind. It is called “The Jack Brabham Story” and you will find it on Amazon if you click here. (Feature image at the head of this post of Jack Brabham and Bruce McLaren courtesy of mclaren.com).